Thank you to everyone who voted in the Board of Directors election! 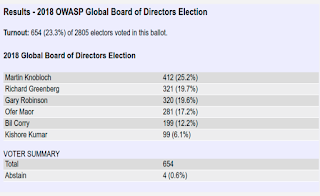 The OWASP Board consists of seven volunteers elected on alternating years to serve a two year term. These unpaid volunteers dedicate themselves to the organizational mission and playing a pivotal role in the software security community. Members of the Global Board of Directors are responsible for setting the strategic direction of the organization and ensuring the financial integrity of the Foundation. 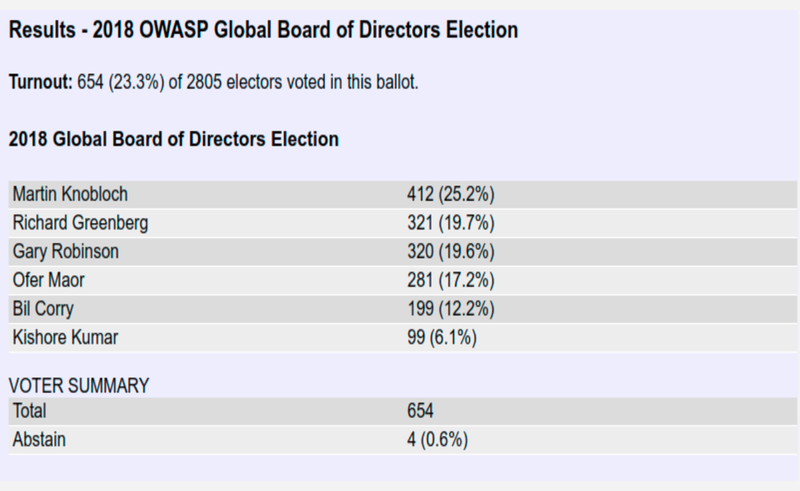 Our thanks to everyone who stood for the board this year, your willingness to take on time consuming duties to further OWASP's mission is greatly appreciated. OWASP is fortunate to have such talented and active volunteers and we look forward to continuing to work with you. To listen to the newly chosen board member interviews click on their names or please visit our Election page. Come January 1, 2019 these three new board members will begin their two year term.